The first release (version 0.1.0.0 beta) of IPS Peek is ready for download. 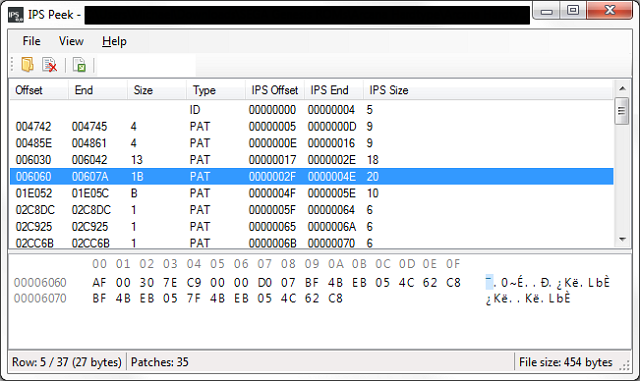 IPS Peek is a tool used to look inside of IPS (International Patching System) patches. * Shows patch records, record sizes, offsets and more! * Shows Lunar IPS truncate extension (CHS). * Shows data (in a hex view) written by a patch record. * Shows total size of all modified data. * Allows exporting of patch information to a text file for later use. IPS Peek is currently in beta, so any feedback or suggestions are welcome. This is really cool... could be really useful for remaking portions of hacks or making notes for complete hacks. people always ask me for my notes... which I dont always have. sometimes I get an idea and make it before I ever write it down lol. and I generally dont track offsets for small things so this would be an easy way to find all the things Ive changed and where they are. Ooh, I like the sound of this! The micromanager in me is looking forward to messing around with this. Tinker: "You're going to go where no one has gone before!" Hero: "We've actually been there before." Tinker: "Oh. Well, you've never been shot out of a turret, with only a minimal chance of survival!" Thanks. I am working on a new beta; it should be out next month some time.